As discussed in the previous section, , , and are typically not found separately; instead, and are found. This is a linear equation which transforms world coordinates to pixel coordinates (recall: and ). However, this does not yet take lens distortion into account. i.e. we’re trying to make the model fit our measurements. We re-parameterized things to be linear in the previous section so that linear optimization can be used. This is possible up until lens distortion is involved. So, an initial guess can be made (usually assuming zero lens distortion, a reasonable assumption for most applications) with linear optimization, and then it is followed up with non-linear refinement with the full camera model. 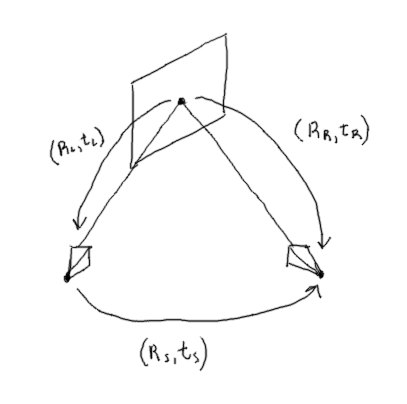 For non-linear optimization, the rotation matrix needs to be re-parameterized so that it has 3 parameters. This is because the rotation matrix has 9 elements, but only 3 degrees of freedom. I use Euler angles here, but Rodriguez’s formula is also popular. 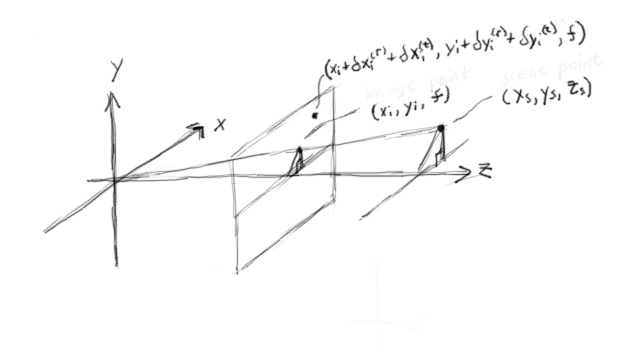 is known as a homography and acts as a projection operator for homogeneous coordinates. Often, it is found up to a scale factor. For this article, I’m assuming a 2D checkerboard pattern is used for calibration. The next sections explain how calibration (i.e. estimation of “intrinsic” and “extrinsic” parameters) is done for this case. One way to get an initial guess for is to get the four corners of the entire checkerboard, then compute a homography, and then reproject the world coordinates of the checkerboard into pixel space. If the lens distortion is low, this should be a reasonable initial guess for , which can then be refined with this method. So now can be solved for using a linear solver. 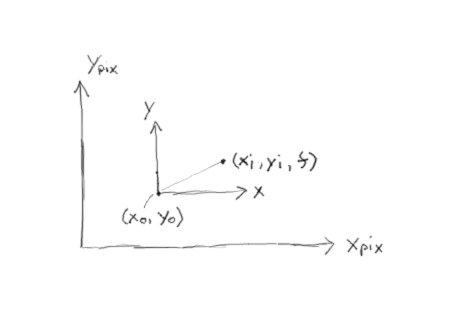 Apply a Gaussian kernel to the sampling points around to give less weight to points further away from the corner. 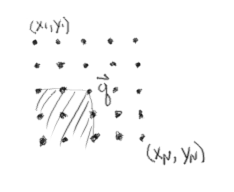 Note that large and large will influence a linear least squares solver more, so if there just happens to be a large gradient far away in the sampling grid, the solver will try to make more orthogonal to that, than a closer gradient with smaller intensity (maybe due to blur), which may not be desirable. Using a Gaussian kernel should help mitigate this potential problem, but it is still an important consideration to keep in mind. If we have two sets of points, for example a set of corner points on our checkerboard in “world coordinates” (i.e. in real units with respect to the checkerboard) and the corresponding set of points in “pixel space” (i.e. 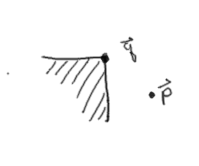 we have detected these corner points in an image we’ve taken of the checkerboard), then we can approximate the transformation from these two sets of points using a homography. The assumption here is we’re using the pin-hole camera model and there is very little lens distortion. Assuming the eigenvalues are sorted in descending order, then the last column of will contain the least eigenvector. Note that since this is a homogeneous equation, once we solve for , what we will actually find is , i.e. a scaled version of . It’s important to keep this in mind. Also, there is a normalized version of the above which makes it more stable and accounts for the fact that ( , ) and ( , ) may have very different scales, which may make ill conditioned. both sets of points are scaled so the average distance from the origin is equal to , which I believe is done to ensure the x and y components are close to 1. The same matrix is also constructed for the set of points in world coordinates, which we call . So now we have a linear method for computing homographies. Another refinement you can do is a nonlinear optimization of the homography using the linear method as the initial guess. This is more or less optional but included for completeness. The first step is to divide the initial linear homography guess by so that . Homographies have 8 degrees of freedom and this is a typical constraint added to parameterize the homography for nonlinear optimization. Next, we derive the Jacobian so we can perform Gauss-Newton iterations (note the initial guess is typically very good and the optimization is well behaved, so in my experience more robust methods like Levenberg-Marquardt aren’t necessary). where i = ideal, m = measured, and p = pix. Now, we have a method to determine a fully optimized homography given two sets of points. After homographies for each image of a calibration board are computed, we need to compute an initial guess for the intrinsic parameters. We can only find an initial linear guess for the parameters in : , , , and . We assume that the lens distortion parameters are zero, which is reasonable for most camera/lens combinations. 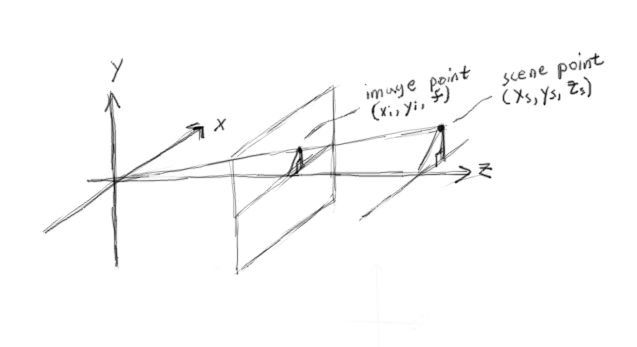 We assume the first two things because the principle point estimation is usually difficult and unstable, so we assume it’s at the middle of the image (this also assumes the first pixel has a position of (1,1); i.e. one-based indexing). It’s also a good assumption for most cameras that = (assuming the pixels are square) and hence = = . These constraints will allow us to get a better initial guess for . Then, you can solve for and take the inverse and square root to recover . You can normalize , , , and by dividing each with their respective norm before solving for . This does not effect the orthogonality constraint and prevents issues in case one of the ‘s are very large. This is what Bouguet does in his Matlab toolbox and from my tests appears to work slightly better than the least squares results. I have a feeling it might be because you obtain a larger when and are not collinear, which in turn results in a smaller and prevents over estimates, but beyond that I’m not really sure. The next step is to get an initial guess of the extrinsic parameters per calibration board image. is 1 (recall we set this constraint when we computed the homography). So, if is constrained to be positive, the effect this has is to ensure is positive. This is correct, as the calibration board is in the positive z direction. and should be equal, but will probably be slightly off due to some combination of model misfit, noise, etc… So we take the average of the two when computing . I won’t give a proof, but it should be somewhat intuitive. You can (optionally) do nonlinear refinement of just the extrinsics (on a per calibration board image basis) before optimizing all parameters, but this only requires modifying the global optimization problem slightly, which I’ll talk about next. Note that by now we have initial guesses for all intrinsic and extrinsic parameters. We can now define a cost function and optimize it across all intrinsic and extrinsic parameters. But, before we do that, it makes things easier to parameterize the camera model with “normalized” coordinates. Now we must find and . Which results in 8+6M total parameters. Where the ‘s represent filled blocks and ‘s are empty blocks. This makes intuitive since, as the intrinsic parameters will affect the residuals for all calibration board images. For extrinsics, only the extrinsic parameters for a specific calibration board image will affect its residuals. As usual, it’s recommended to use a sparse linear solver instead of directly taking the inverse. All initial guesses are used from the previous sections. , , , and are all initialized to zero. is usually initialized to 0.01 and will either grow or shrink every iteration depending on whether the mean squared error (MSE) increases or decreases. If MSE decreases, then is decreased and we proceed to the next iteration. If MSE inceases, then we increase until MSE descreases. Increasing lambda has the two effects: 1) it makes the step closer to the gradient and 2) it reduces the step size. Decreasing lambda has the effect of making the step closer to the Gauss-Newton method, which is an agressive optimization. Using small steps in the direction of the gradient is incredibly robust, but slightly slow. 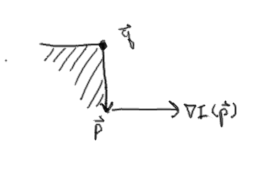 If there is only a single calibration board image, the principle point is removed from the optimization (simply remove the columns from the Jacobian corresponding to those two parameters, and then do not update them during the iterations), as it is very unstable. We now have enough information to fully calibrate and optimize a camera using a checker board calibration target. We get initial guesses for the intrinsics, , , and by doing single camera optimization on each camera separately. Instead of optimizing , , , and for each calibration board image, we instead optimize , , , and . This reduces the number of extrinsic parameters from 12M to 6M+6, where M is the number of calibration board image pairs. We now have a model for stereo vision and a way to provide an initial guess for this model. , , , have the same form as single camera calibration. and have the same form as single camera calibration. , , , are new quantities that we need to derive. The rest of the Jacobians have already been derived in the single camera calibration section. Which results in 22+6M total parameters. Where, like before, the ‘s represent filled blocks and ‘s are empty blocks. is set and used as described in the single camera calibration section. 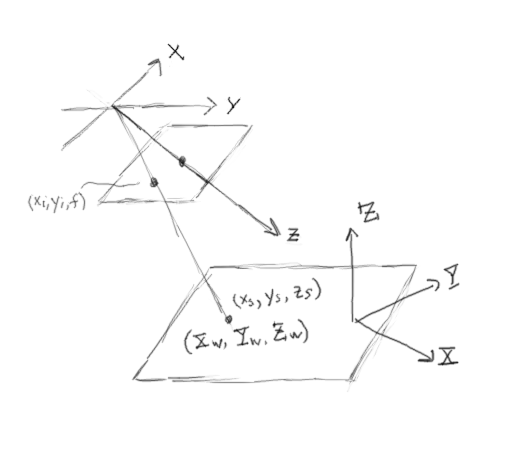 If there is only a single calibration board image, the principle point is again removed from the optimization similarly to the single camera calibration section. Now, we can perform camera calibration for stereo cameras using a checkerboard calibration target. The next article will go over how to do this in Matlab.